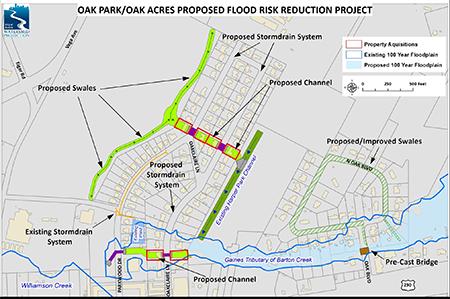 Watershed Protection is planning two projects to reduce flooding in the Oak Park and Oak Acres subdivisions. The project will improve the low water crossing on Oak Blvd. to make the neighborhood more accessible during floods. We will also upgarde the drainage ditches and culverts to handle local runoff. Making changes to two channels so they can handle more water and have a natural look. Enlarging culverts on Oakclaire Dr. and Parkwood Dr. Installing a new storm drain system. Preliminary Engineering – a solution is identified and costs are estimated. Design – the details are worked out and construction plans drawn up. Bidding and Permitting – a contractor is hired and all permits are acquired. In October 2017, the preliminary engineering phase was completed. Construction for both projects is expected to begin in 2020. Consider purchasing flood insurance for both the structure and the contents. You do not need to be in a floodplain, and renters can purchase policies too. Rates will be lower now before the floodplain information is submitted to FEMA. Contact your insurance agent. 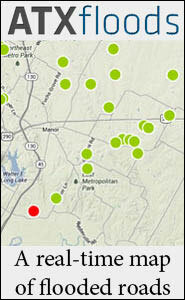 Stay informed by signing up for Warn Central Texas. Have an emergency plan. Please keep in mind that you may be safer staying at your home than trying to escape a flood in your vehicle. 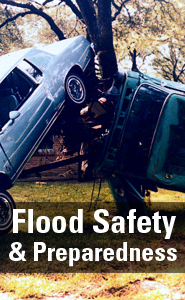 Most fatalities during floods happen in vehicles. There are several streets in this neighborhood that may be impassible with enough rain. Get to know your neighbors. They are often the ones who can respond first in an emergency. To receive email updates, please send an email to Stephanie Lott.